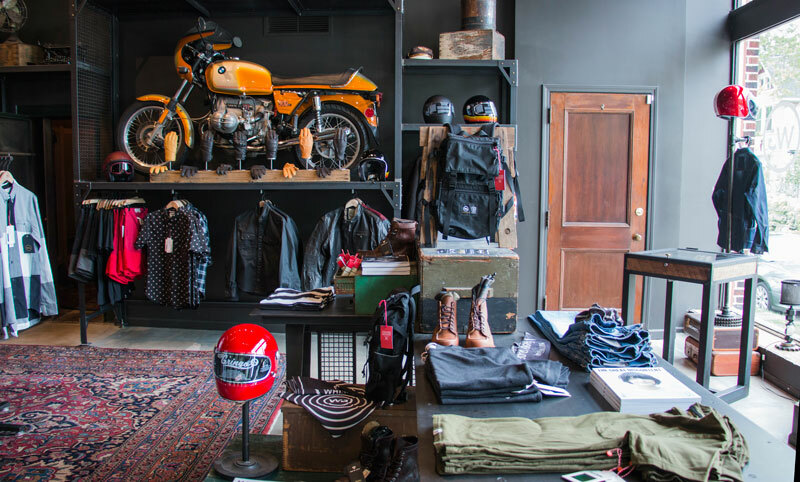 Located in the bustling neighborhood of Ohio City just outside of downtown Cleveland, Ohio is home base for Whiskey Grade, a moto fashion and fuel-inspired apparel store. It’s a different concept than most people are used to seeing in the motorcycle industry and for that reason it’s attracting a new crowd to the sport in just its first year. Two scenarios tend to happen in a Whiskey Grade store – women walk in because they hear about the store and then they find beautiful dresses that are competitively priced. Men come in because they see motorcycles and then they find out there is men’s clothing. Everybody ends up winning because they find apparel that suits them and a style that is different from the everyday norm. Wronkovich has been in the motorcycle industry for 30-plus years. He’s been a franchised dealer for just about everybody – Honda, Kawasaki, Suzuki, Ducati, Harley-Davidson, Polaris, etc. He currently owns three Harley dealerships in addition to the Whiskey Grade stores. Whiskey Grade is a Cleveland-based company with other locations in Denver and Los Angeles and manufacturing in California. The store doesn’t focus on functional riding gear, but rather moto fashion. “Whiskey Grade men’s clothing is very manly,” says Wronkovich. “It’s salvaged denim, heritage work wear. Think Levi’s, Red Wings, etc. We do flannel, really nice button downs and tees. There is a lot of heritage in our men’s wear. Just like other well-known retail stores, Whiskey Grade wants you to know when you’re in one of its locations. There is always a little bit of a look and feel so that you can tell you’re in a Whiskey Grade store. Scents and color cues remind people where they are. Being inspired by the motorcycling industry is exactly what Wronkovich and Whiskey Grade want to influence in customers. Whiskey Grade stemmed out of the fact that Wronkovich is concerned about the industry as a whole losing growth and needing to attract a new crowd. Wronkovich is hopeful Whiskey Grade, and its neighbor, the newly opened Ohio City Moto, are part of the answer. Lucky for Wronkovich and Whiskey Grade, the Ohio City location happened to have an adjoining building space open for rent, almost too perfect for a used motorcycle dealership that could attract new people to the sport. 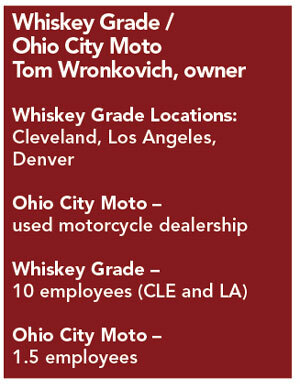 Ohio City Moto is strictly a used motorcycle store supplied through Wronkovich’s H-D dealerships’ used inventory. Its hottest selling bikes are older Japanese motorcycles like a Concourse or CB550 and things that are priced around the $2,000 to $5,000 price range, including scooters. While Ohio City Moto doesn’t currently operate under any one OEM, Wronkovich was taking meetings with Royal Enfield to help the dealership get off the ground. Another unique aspect you’ll notice about Ohio City Moto is there isn’t a parts department or service department. The shop partners with Skidmark Garage and Cleveland Cycle Works to take care of those needs. Ohio City Moto markets on Cycle Trader, Craigslist and eBay to get traffic. However, the best results are from getting out and actually going places. “We just moved in a month ago and we are still figuring out what we are doing and where we are headed,” Wronkovich notes. In the meantime, Wronkovich continues to spread the word about Whiskey Grade and Ohio City Moto. “We set up meet and greets, bike nights and other events,” he says. “We also have a lot of non-moto events we go to such as the Cleveland Flea, Miami Yacht Show, a PGA event in Houston, etc. We try to do things where people would never see our brand or motorcycles at all. People see a motorcycle and it attracts the men, and then the women see that we have dresses and they start looking around, too. To further attract attention and a different crowd to his store and the sport, Wronkovich is currently in the midst of doing a traveling event called Motos Across America. With three Harley dealerships, three Whiskey Grades and Ohio City Moto, you may be wondering how Wronkovich finds time for it all.